Member-to-Member “M2M” Discounts are offered by Chamber Members to the staff and ownership of Chamber Member businesses and can include a wide range of products and services. Is your business a Member? Look up your business in our Directory. Learn how to offer your own M2M discount below, or download our handy instruction sheet. How Do I Redeem a Discount? It’s easy – no secret handshake or promo code! Just identify yourself as a Chamber Member or Chamber Member employee at participating Member locations to receive your M2M Discount. Contact your agent or, if you’re not already a customer, the agents listed below at our participating brokerages and advise them of your status as a Chamber Member – you could save hundreds of dollars a year on your personal and business insurance! Discounts vary from broker to broker. 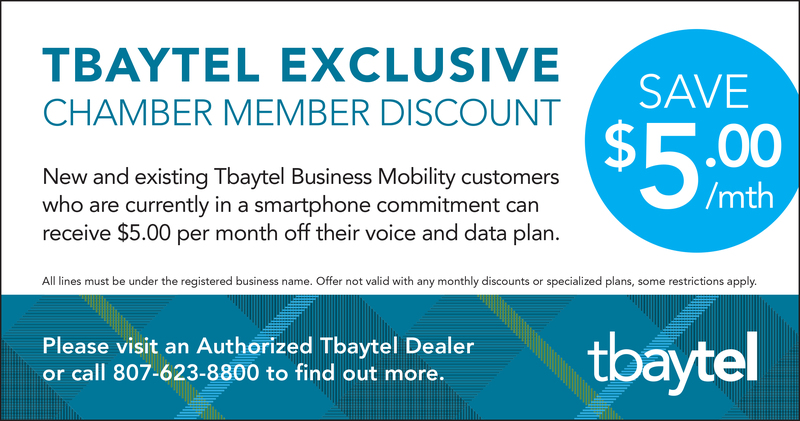 New and existing Tbaytel Business Mobility customers who are currently in a smartphone commitment can receive $5.00 per month off their voice and data plan. All lines must be under the registered business name. Offer not valid with any monthly discounts or specialized plans, some restrictions apply. How do I Participate as a Business Owner? Offer discounts! Login to your Chamber Member Information Centre and click on the M2M Deals tab on the left side bar. Download our handy instructions for more details. Enjoy discounts! Check out current M2M Discounts at www.tbchamber.ca/m2m. Cards not required! Chamber Members simply state that they work for a Chamber Member at participating locations to receive M2M Discounts. Don’t have a login yet? It’s not necessary to have one to enjoy Member-to-Member discounts; all staff of Chamber Members are eligible for M2M offers. If you need to login to the system to update business information or manage Deals you’re offering to other Members, contact us at (807) 624-2626 or chamber@tbchamber.ca to receive a setup email. The members participating in this Value Added Discount Program expressly acknowledge and agree that the Thunder Bay Chamber of Commerce will not be liable for any losses, claims, damages, demands, liabilities or expenses of any kind or nature, direct or indirect, which may be suffered by members of the Chamber as a result of their participation in this Program.